We’re previewing each of these forces to give you a taste of what the book can do to transform your business. To start from the beginning, read Force #1, Force #2, and Force #3. To maximize the value of your digital membership program, you need to make use of analytics. While “analytics” may feel like a four-letter word to some publishers, they’re actually awesome. Analytics provide proof when you’re doing something wonderful (so you can leverage your efforts) and, when you’re not, help you catch yourself before you fall (so you can course correct). But how do you define success? What exactly should you measure and experiment with? There are three legs to this stool. A dashboard should foster a disciplined review and understanding of the most important numbers in your business. It should contain five to nine key metrics you can carefully track to make sure your strategy is heading in the direction of your agenda and you are on track with your goals. Dashboards give you the power to leverage the winning initiatives in your business and tweak or cut the losers. What’s more, your dashboard is an organizational leadership tool; you want your whole team to rally around these numbers. If something is off, either good or bad, that’s when you do a deep dive to figure out how to further capitalize on the success or reverse the failure. For example, if you see a spike, ask what else you can learn from that number. If something is off, ask yourself, “What is going on?” What can we do to right the ship? Or should we take a step back and reset our goals? Focus on your members’ reactions to you. Collect feedback. While it can be a special brand of painfulness to hear negative customer feedback after so much hard work, it’s actually a gift. Constructive criticism—whether it’s about the products in your pyramid, user experience on your site, customer service, or something else entirely—will help your business thrive. While there are any number of ways to collect and measure your customers’ feedback, we suggest using a Net Promoter Score (NPS). The beauty of an NPS is that it is easy, practical, and actionable. You simply ask customers, “How likely is it that you would recommend us to a friend or colleague?” Then provide a scale from 10 (“extremely likely”) to 1 (“Not likely at all”). Anyone who responds with a 7 or 8 is “Passive.” And finally, anyone who responds with a 6 or below is a “Detractor.” This group tends to have low retention rates and is costly to serve. They may also damage your reputation in the marketplace with negative word-of-mouth. Your Net Promoter Score is equal to the percentage of people who are Promoters minus the percentage of people who are Detractors. Research shows there is a direct correlation between NPS and revenue. In fact, companies with the highest scores in their category grow at over twice the rate of the category average. A dashboard and customer feedback are inherently backward-facing. The dashboard shows you the results of the work you’ve already put in, and NPS tells you about a prior experience between you and a customer. But when a number on your dashboard is off track and needs to be tweaked, or if you’ve just come up with a fresh idea, or you need to address a key customer service issue, then it’s time to face forward. What can you do differently to improve? Experiment by running A/B split tests. A/B split tests involve creating two versions of a page or form or email and dividing traffic between the two so you can measure which one performs better. You can test nearly everything in your customer’s journey, from email subject lines to CTA button design to check out methods and more. Split tests are also one key to becoming more conversion-oriented. If you have a relatively low pyramid entry point for your whales—say, their email in exchange for a free ebook—but you can’t seem to get anyone to sign-up, test some variations to see if anything changes your results. Maybe the call-to-action is at the bottom of a landing page and would be better served above the fold? Or perhaps the language doesn’t sell the value proposition very well? Run a split test (or several) until you find the winning combination. Don’t just run a slate of “random” A/B tests. Focus on what I call your learning agenda. Or, to think of it a different way, ask yourself what would you like to discover about your customers. Are you trying to understand the best price point or trial period? Are you trying to understand what piece of free content will generate the highest number of leads? Think like a scientist and be hypothesis-driven. What open questions (coming out of the Dashboard and the NPS surveys) do you want answers to? Once you’ve defined your agenda, then you can devise a series of A/B tests to get you answers. …Dust yourself off and try again. The fourth force of online revenue growth is one you’ll revisit time and time again. While you might update your product pyramid or poll your whales several times a year, measuring and experimenting is a constant piece of the puzzle for your sales strategy. With your eyes on your dashboard and permission to try new tests, you can enter a state of constant improvement, so that one failed test is simply a leg up towards your next big win. 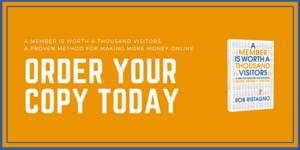 To learn what metrics you should track in your dashboard, how to calculate and maximize your net promoter score, and for advice on defining success and knowing when to drop a failed experiment, order your copy of the book: A Member Is Worth a Thousand Visitors: A Proven Method For Making More Money Online.